Varicose veins are enlarged and swollen veins. They’re most common in the legs, but can happen anywhere. Veins have one way valves to channel blood back to the heart. 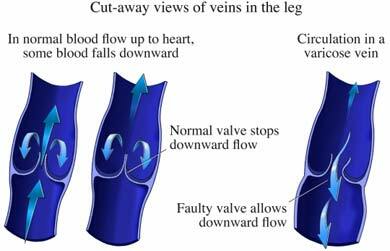 Damage to the valves causes blood to pool in the veins. This causes them to get bigger. They’re also easier to see under the skin. The doctor will ask about your symptoms and health history. Your answers and a physical exam may point to varicose veins. In some cases, a Doppler ultrasound may be done. Not standing or sitting for long periods of time. Resting with your legs raised above your heart. Moving your legs around when standing or sitting for long periods of time. Wearing compression stockings. They may help improve blood flow in your legs. To lower your chances of varicose veins. Lose excess weight if you need to. Don’t stand or sit for long periods of time. Move around when you can.